Hot air balloons are the oldest successful human flight technology, dating back to the Montgolfier brothers' invention in Annonay, France in 1783. The first flight carrying humans was made on November 21, 1783, in Paris by Pilâtre de Rozier and the Marquis d'Arlandes. Hot air balloons that can be propelled through the air rather than just being carried along by the wind are known as airships or, more specifically, thermal airships. Attractive aspects of ballooning include the exceptional quiet (except when the propane burners are firing), the lack of any perceptible feeling of movement and the birds-eye view. Since the balloon moves with the wind, the passengers feel absolutely no wind, except for brief periods during the flight when the balloon climbs or descends into air currents of different direction or speed. A hot air balloon consists of a bag called the envelope that is capable of containing hot air. Suspended beneath is the gondola or wicker basket (in certain, long distance or high altitude balloons, a capsule) which carries a source of heat capable of producing a sufficient temperature gradient between the air inside the envelope and the surrounding air mass to give enough lift to keep the balloon and its passengers aloft. Unlike gas balloons, the envelope does not have to be sealed at the bottom since the rising hot air only exerts pressure on the upper hemisphere of the balloon to provide lift. In today's sports balloons the envelope is generally made from nylon fabric and the mouth of the balloon (closest to the burner flame) is made from fire resistant material. Recently, balloon envelopes have been made in fantastic shapes, such as hot dogs, rocket ships, and the shapes of commercial products. Unmanned hot air balloons are mentioned in Chinese history. Zhuge Liang in the Three Kingdoms era, Shu Kingdom, used airborne lanterns for military signaling. These lanterns are known as Kongming lanterns (孔明灯). There is also some speculation that hot air balloons were used by the Nazca Indians of Peru some 1500 years ago as a tool for designing vast drawings on the Nazca plain. The first clearly recorded instances of balloons capable of carrying passengers used hot air to obtain buoyancy and were built by the brothers Josef and Etienne Montgolfier in Annonay, France. They were from a family of paper manufacturers who had noticed the ash rising in fires. After experimenting with unmanned balloons and flights with animals, the first balloon flight with humans on board took place on 19 October 1783 with the physician Pilâtre de Rozier, the manufacture manager, Jean-Baptiste Réveillon and Giroud de Villette, at the Folie Titon in actual Paris. Officially, the first fly was 1 month later, 21 November 1783. King Louis XVI had originally decreed that condemned criminals would be the first pilots, but a young physicist named Pilâtre de Rozier and the Marquis Francois d'Arlandes successfully petitioned for the honour. The first hot air balloons were basically cloth bags (sometimes lined with paper) with a smoky fire built on a grill attached to the bottom. They had a tendency to catch fire and be destroyed upon landing. The first military use of aircraft took place during the French Revolutionary Wars, when the French used a tethered Hydrogen balloon to observe the movements of the Austrian army during the Battle of Fleurus (1794). Hot air balloons were employed during the American Civil War. Though the military balloons used by the Union Army Balloon Corps under the command of Prof. Thaddeus S. C. Lowe were limp silk envelopes inflated with coke gas or hydrogen, the Confederate Army did attempt to counter with a rigid Montgolfier style hot air, or "hot smoke balloon." Captain John R. Bryant inflated his rigid cotton balloon with a fire of oil-soaked pine cones. The balloon was soon captured by Union forces as the Confederate's techniques of balloon handling were not competent. The first modern hot air balloon was designed and built in 1960 by Ed Yost. He made the first free flight of such an aircraft in Bruning, Nebraska on 22 October 1960. Initially equipped with a plastic envelope and kerosene fuel, Yost's designs rapidly moved onto using a modified propane powered "weed burner" to heat the air and lightweight nylon fabric for the envelope material. Today, hot air balloons are used primarily for recreation. There are some 7,000 hot air balloons operating in the United States. Hot air balloons are able to fly to extremely high altitudes. On November 26, 2005, Vijaypat Singhania set the world altitude record for highest hot air balloon flight, reaching 21,290 meters (69,852 feet). He took off from downtown Bombay, India and landed 240 km (150 miles) south in Panchale. The previous record of 19,811 meters (64,980 ft) had been set by Per Lindstrand on June 6, 1988 in Plano, Texas. The furthest that a hot air balloon has ever been flown is 7,671.91 km. On January 15, 1991, the Virgin Pacific Flyer balloon completed the longest flight in a hot air balloon when Per Lindstrand (born in Sweden, but resident in the UK) and Richard Branson of the UK flew from Japan to Northern Canada. With a volume of 74,000 m³ (2,600,000 ft³), the balloon envelope was the largest ever built for a hot air craft. Designed to fly in the trans-oceanic jetstreams the Pacific Flyer recorded the highest ground speed for a manned balloon at 245 mph (394 km/h). The longest duration hot air balloon flight ever made is 50 hours and 38 minutes made by Michio Kanda and Hirosuke Tekezawa of Japan on January 2, 1997. A hot air balloon is partially inflated with cold air from a petrol-driven fan, before the propane burners are used for final inflation. A hot air balloon for manned flight uses a single layered, fabric gas bag (lifting "envelope"), with an opening at the bottom called the mouth. Attached to the envelope is a basket, or gondola, for carrying the passengers. Mounted above the basket and centered in the mouth is the "burner" which injects a flame into the envelope, heating the air within. Raising the air temperature inside the envelope makes it lighter than the surrounding (ambient) air. This causes the balloon and its payload to rise. Modern hot air balloons are usually made of synthetic fabrics such as ripstop nylon, a light weight fabric of high strength. During the manufacturing process, the material is cut into panels and sewn together, along with structural load tapes (webbing) that carry the weight of the gondola or basket. The heater or burner is fueled by propane, a liquefied gas stored in pressure vessels, similar to high pressure forklift cylinders. 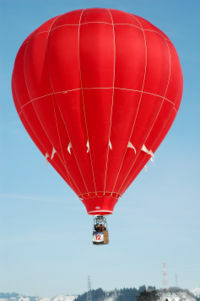 The amount of lift (or buoyancy) provided by a hot air balloon depends primarily upon the difference between the temperature of the air inside the envelope and the temperature of the air outside the envelope. For most envelopes made of nylon fabric, the maximum internal temperature is limited to approximately 120 °C (250 °F). It should be noted that the melting point of nylon is significantly higher than these maximum operating temperature — about 230 °C (450 °F). However the lower temperatures are generally used because the higher the temperature, the more quickly the strength of the nylon fabric degrades over time. With a maximum operating temperature of 120 °C, balloon envelopes can generally be flown for between 400 and 500 hours before the fabric needs to be replaced. Many balloon pilots operate their envelopes at temperatures significantly below the maximum in order to extend the longevity of their envelope fabric. For typical atmospheric conditions, a hot air balloon requires about 3 cubic meters of envelope volume in order to lift 1 kilogram (50 ft³/lb). The precise amount of lift provided depends not only upon the internal temperature mentioned above, but the external temperature, altitude above sea level, and humidity of the surrounding air. On a hot day, the balloon cannot be loaded as much as on a cool day, because the temperature required for launch will exceed the maximum sustainable for nylon envelope fabric. In the lower atmosphere, the lift provided by a hot air balloon decreases about 3% for each 1,000 meters (1% per 1,000 ft) of altitude gained. A pair of Hopper balloons. A range of envelope sizes is available. The smallest, one-person, basket-less balloons (called " Hoppers" or " Cloudhoppers") have less than 1,000 cubic meters (35,000 ft³) of envelope volume. At the other end of the scale are the balloons used by large commercial sightseeing operations that carry well over two dozen people and have envelope volumes of up to 15,000 cubic meters (600,000 ft³). 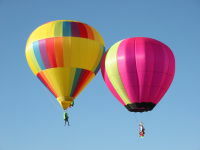 However, most balloons are roughly 2,500 cubic meters (100,000 ft³) and carry 3 to 4 people. The Rozier type of hybrid balloon, called after its creator, Jean-François Pilâtre de Rozier, has separate cell for helium as well as a cone below for hot air (as is used in a hot air balloon) to heat the helium at night. The direction of flight depends on the wind, but the altitude of the balloon can be controlled by changing the temperature of the air inside the envelope. The inside of a hot air balloon's envelope, seen from the gondola. The top of the balloon usually has a vent of some sort. The most common type of vent is a disk-shaped flap of fabric called a parachute vent. The fabric is connected around its edge to a set of "vent lines" that converge in the centre. (The arrangement of fabric and lines looks roughly like a parachute -- thus the name.) These "vent lines" are themselves connected to a control line that runs to the basket. A parachute vent is opened by pulling on the control line. Once the control line is released, the pressure of the remaining hot air pushes the vent fabric back into place. A parachute vent can be opened briefly while in flight to initiate a rapid descent. (Slower descents are initiated by allowing the air in the balloon to cool naturally.) The vent is pulled completely open to collapse the balloon after landing. An older, and today less commonly used, style of vent is called a "Velcro-style" vent. This too is a disk of fabric at the top of the balloon. However, rather than having a set of "vent lines" that can repeatedly open and close the vent, the vent is secured by "hook and loop" fasteners (such as Velcro) and is only opened at the end of the flight. Balloons equipped with a "Velcro-style" vent typically have a second "maneuvering vent" built into the side (as opposed to the top) of the balloon. Some hot air balloons have turning vents which are side vents which, when opened, cause the balloon to rotate. Such vents are particularly useful for balloons with rectangular baskets in order to align the wider side of the basket for landing. The largest manufacturer of hot air balloons in the world is Cameron Balloons of Bristol and part owned subsidiary company, Lindstrand Balloons of Oswestry, England. Aerostar International, Inc. of Sioux Falls, South Dakota is North America's largest balloon manufacturer and is a close second in world manufacturing (note: Aerostar will no longer be building balloons beginning January 2007). Firefly Balloons, formerly known as The Balloon Works, is another popular manufacturer of hot-air balloons located in Statesville, North Carolina. Another long time producer of hot air balloons is Head Balloons, Inc., located in Helen, Georgia. Cameron Balloons, and another English balloon manufacturing company, Thunder and Colt (since acquired by Cameron), have been the main innovators and developers of special shaped balloons. These hot air balloons use the same principle of lift as conventional inverted teardrop shaped balloons but often sections of the special balloon envelope shape make no contribution to the balloon's ability to stay afloat. They have been produced in great variety and with eye-popping invention and wit. Hot air balloon being inflated by its propane burners prior to a dawn launch. Most hot air balloon launches are made during the cooler hours of the day, at dawn or two to three hours before sunset. At these times of day, the winds are typically light making for easier launch and landing of the balloon. Flying at these times also avoids thermals, which are vertical air currents caused by ground heating that make it more difficult to control the balloon. In the extreme, the downdrafts associated with strong thermals can exceed the ability of a balloon to climb and can thus force a balloon into the ground. A hot air balloon flight starts with unpacking the balloon from its carrying bag. A gasoline-powered fan is used to blow cold (outside) air into the envelope. 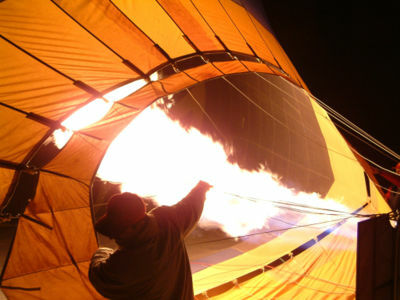 The cold air partially inflates the balloon to establish its basic shape before the burner flame is aimed into the mouth heating the air inside. A crew member stationed opposite the mouth, holds a rope (crown line) tied to the apex (crown) of the envelope. The "crown-man" role is two fold, one is to prevent the envelope from excessive sway and two is to prevent the balloon rising until it is sufficiently buoyant. Once the balloon is upright, pilot and passengers climb into the basket. When the pilot is ready for launch, more heat is directed into the envelope and the balloon lifts off. During the flight, the pilot's only ability to steer the balloon is the ability to climb or descend into wind currents going different directions. Thus, it is important for the pilot to determine what direction the wind is blowing at altitudes other than the balloon's altitude. To do this, the pilot uses a variety of techniques. For example, to determine wind directions beneath the balloon a pilot might simply spit or release a squirt of shaving cream and watch this indicator as it falls to determine where possible turns are (and their speed). Pilots are also looking for other visual clues such as flags on flagpoles, smoke coming from chimneys, etc. 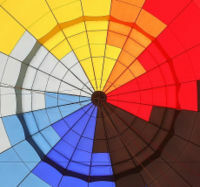 To determine wind directions above the balloon, the pilot will obtain a weather forecast prior to the flight which includes upper level wind forecasts. The pilot will also send up a helium pilot balloon, known as a met-balloon in the UK and pibal in the USA, prior to launch to get information about what the wind is actually doing. Another way to determine actual wind directions is to watch other hot air balloons, which are the equivalent of a large met-balloon. The crew then pack up inflation equipment and follow the balloon with the retrieve vehicle. Once the balloon has landed, the envelope is deflated and detached from the basket. The envelope is then packed into its carrying bag. The burner and the basket are separated and all components are packed into the retrieve vehicle. The top of a hot air balloon generally has a flap of fabric (often referred to as a parachute) that can be pulled partially open (via a long line connecting the parachute device to the gondola or basket) to allow the balloon pilot to release hot air in an emergency or for better control of descent. 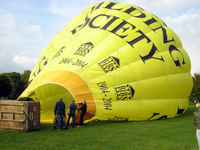 The flap is pulled completely open to collapse the balloon after landing. In competition, the pilots need to be able to read different wind directions at different altitudes. Balloon competitions are often called "races" but they're most often a test of accuracy, not speed. For most competitive balloon flights, the goal is to fly as close as possible to one or more exact points called "targets". Once a pilot has directed the balloon as close as possible to a target, a weighted marker with an identifying number written on it is dropped. The distance between a pilot's marker and that target determines his or her score. During some competitive flights, pilots will be required to fly to 5 or more targets before landing. To assist with navigation, topographic maps and GPS units are used. Another common form of competition is the "Hare and Hound" race. The Hare balloon takes off a set amount of time before the Hound balloons and typically flies with multiple altitude changes to make it more difficult for the chasing balloons to match its flight path. After a set amount of flight time, the Hare will land and typically lay out a target cross for the Hounds to drop their weighted markers near. As above, the distance between a pilot's marker and the target determines his or her score. Some experienced pilots are able to take a flight in one direction then rise to a different altitude to catch wind in a returning direction. With experience, luck, and the right conditions, some pilots are able to control a precision landing at the destination. On rare occasions, they may be able to return to the launch site at the end of the flight. This is sometimes called a box effect, usually when flying in valleys with drainage winds. The dangers of the sport include excessive (vertical or horizontal) speed during landing, mid-air collisions that may collapse the balloon, and colliding with high voltage power lines. It is the last of these, contact with power lines, that poses the greatest danger. For instance, roughly 90% of serious ballooning accidents in the US involve power line strikes. One reason for the high frequency of such incidents is the fact that pilots often attempt to land their balloons on or near roads in order to reduce the amount of off-road driving necessary to recover the balloon. However, in most rural areas where balloons fly, roads usually have power lines running along them. The recent advent of vertically aerodynamic sport balloons which can climb and descend at twice the rate of a conventional balloon (1500 ft/min as opposed to 700 ft/min) has significantly increased the danger posed by collision or accidental ground impact during competition. Many pilots have also reported strange aerodynamic performance during very aggressive climbs, such as greatly reduced air resistance at vertical speeds over +1500 ft/min, resulting in a sudden, unexpected acceleration. At present there is little research into high vertical-speed balloon flight to understand this phenomenon. The FAA requires balloons to fly under visual flight rules. If equipped with lights that make it visible to other aircraft, balloons can fly in the dark. However, such flights are usually limited to either "dawn patrol" flights that begin before sunrise with landings made after there is sufficient light to see any obstacles or to race/record flights that typically go throughout the night and the landing again made during daylight hours. 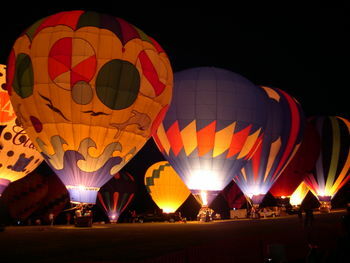 Tethered balloons are sometimes inflated at night, an event called a "night glow" for the impressive visual effects. At such events, pilots will usually operate the liquid valve known as the whisper burner (or sometimes called the cow burner) on the burner creating a spectacular bright orange flame instead of the main valve which creates the more typical (and efficient) blue flame. There are many regular gatherings of balloons and balloonists around the world. Most of these events are held on annual basis. The festivities provide both a place for balloonists to interact as well as a venue for entertaining spectators. Events range in size from a few balloons and no spectators to hundreds of balloons with hundreds of thousands of spectators.